Tokyo Metro (Head Office in: Taito Ward, Tokyo; President: Yoshimitsu Oku) has installed Tourist Information Boards ("Welcome Boards" below) for use by foreign visitors to Japan that provide multilingual information on passenger tickets, subway route guides to key sightseeing spots, subway route maps containing such spots, the company's free Wi-Fi service provided to foreign visitors to Japan free of charge, and more at sixteen locations spread across fourteen stations. In order to ensure that foreign visitors to Japan, whose numbers continue to increase, are able to smoothly reach their destination when using Tokyo Metro, displays called "Tokyo SUBWAY Navigation for Tourists Plus" that enable passengers to search Tokyo subway routes (for Tokyo Metro and Toei Subway Lines) in five languages by operating the displays themselves will be installed on those Welcome Boards. The installation of these displays will be performed successively starting on Friday, March 31, 2017. 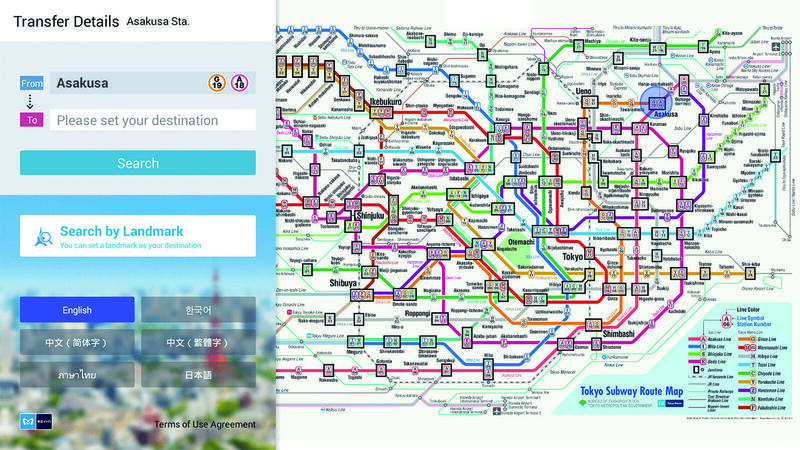 For route search functions offered by "Tokyo SUBWAY Navigation for Tourists Plus," a function that displays routes on foot from the station closest to the passenger's intended destination to that destination has been coupled with the subway transfer search function on the "Tokyo SUBWAY Navigation for Tourists" mobile application, which has now been download over 1.7 million times worldwide. Copyright © Tokyo Metro Co., Ltd. Todos los derechos reservados.